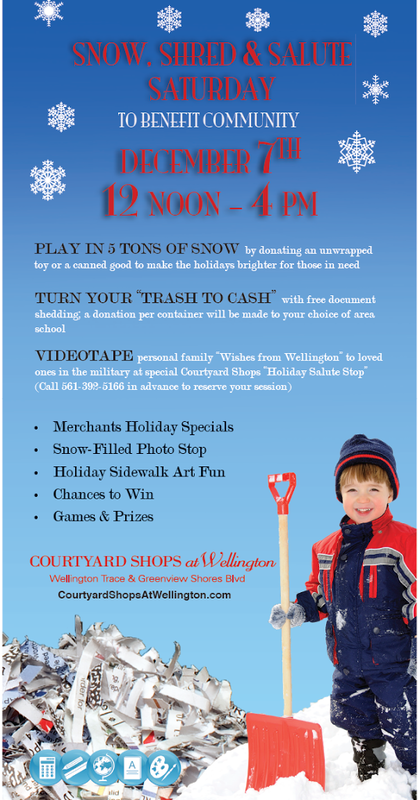 WELLINGTON, Fla. (November 25, 2013) – Courtyard Shops at Wellington invites the community to celebrate the holiday season amidst six tons of snow at the shopping center’s memory-making “Snow, Shred & Salute Saturday” family shop-and-dine event on December 7th from 12 noon to 4 p.m. that will benefit area nonprofits and schools, and provide a special opportunity for families to tape “Wishes from Wellington” holiday video greetings produced and donated by Michael Miller of Sell-Ware for loved ones to send to active duty troops stationed away from home this holiday season. A jam-packed open-to-the-public program of fun for all generations awaits event-goers, as the Courtyard Shops becomes a family-packed afternoon winter wonderland destination. There will be both a snow-filled play area and a spirited holiday-themed photo stop, with FREE admission granted for bringing a canned good or unwrapped new toy that will be donated to local nonprofit organizations just in time to make the holiday brighter for those in need. In addition to holiday sidewalk chalk art fun along designated walkways of the center, games and prizes, “chances to win” and merchant holiday specials, sales and discounts, a special “salute video spot” will also be set up on-site where families of those serving in active military service can tape their own holiday greeting video to send and share. To assure a timeslot, military families are asked to reserve a session in advance by calling Kaye Communications at 561-756-3099 or emailing videosalute@kcompr.com. The popular Courtyard Shops at Wellington “Shred-4-Ed” program also returns to give area residents and businesses yet one more year-end opportunity to “turn their trash into cash” to benefit local school(s) of their choice. Taking place alongside the snow activities from noon to 3 p.m., participants can use the free Shred-4-Ed service to discard unwanted clutter and gain peace of mind by safely disposing of personal documents, credit card offers, receipts, check stubs and any other material with sensitive data, all at no charge, with a donation to a local school of their choosing made by Courtyard Shops at Wellington for each container brought to be shredded. The donations accumulated through the three-month series and this additional opportunity will be distributed among more than a dozen local elementary, middle and high schools following this event. Conveniently located at 13860 Wellington Trace in Wellington at the corner of Wellington Trace and Greenview Shores Blvd, the Courtyard Shops at Wellington is a retail destination with more than 30 shops and restaurants including Publix, Kontiki, Van Dell Jewelers, Eyes of Wellington, Lindburgers Restaurant, Tijuana Flats, Sam Jon’s Hair Studio and My Gym Children’s Fitness Center. For more information on this event, visit courtyardshopsatwellington.com, become a fan at facebook.com/courtyardshopswellington, or call (561) 347-6521.